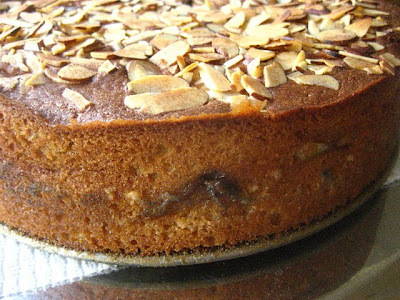 Is it ok to bake an apple cake when it's spring? Shouldn't I be baking rhubarb cakes instead? We've had 2 snows this week, so I think this fits in perfectly with the weather. (if this keeps up, I will be back to making stews). I always have apples in the house. I use them mostly during the fall and winter, however I can't pass up an apple dessert, no matter what the season. I would choose apple over chocolate cake any day. This delicious cake was terrific for breakfast with coffee and did well packed in my husband's lunchbox during the week (yes, he still has his Flintstones lunchbox!). It is perfect for springtime, when there is still a nip in the air or any time. Preheat the oven at 350ºF (180ºC). Peel and slice the apples. Toss them with 1 tbsp cinnamon and 4 tbsp sugar. Set aside. They will get nice and syrupy. In another bowl, cream the softened butter and the sugar until light and fluffy. Add the eggs, one at a time, beating after each addition. Fold the sifted flour alternately with milk. Grease a 9" springform pan. Pour half the batter in then spread the apples over the batter. Spread the remaining batter over the apples evenly. Sprinkle with the sliced almonds. Bake for one hour in a 350F oven or until a toothpick inserted comes out clean. Let rest in the pan for 30 minutes until removing the sides. I don't carry a lunchbox, but I'd sure love a slice of that cake - any season of the year. love the beautiful fork too. Homeslice. The slang term my teenage sons use for a friend, a buddy. Perfect for your springtime cake. Ooohhh that ramshackle paving of browned almond slices on top, gets me everytime! So, do you answer to WILMA!?! 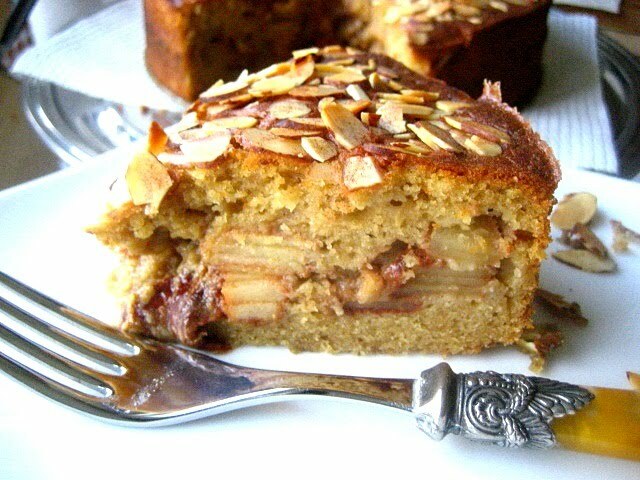 I love the whole look of this cake, who cares you're still using apples, ( I'm not a rhubarb person anyway) and besides it's 24 degrees here today. Happy Spring! I personally think that apples are anytime fruits...and I haven't seen any particularly good looking rhubarb lately, so I say go for it! This cake looks fabulous! This looks fabulous, actually like something you would see in a little French bakery! I think apples are always in season, they have such universal appeal and the smell when you are baking with them is so heavenly! Thanks for a great looking recipe! I think apple desserts are great any time of year. And I like them best when they are simple and homey like this beauty. Yep, that'll be the next cake I make! I love apples (and rhubarb)and this looks delish! I've been looking at your blog for a few months now, and this is the first recipe I've made. Being a busy mom of 3, it's difficult for me to always have the right ingredients on hand, especially because my children are always emptying the refrigerator. Luckily for me, I had everything I needed to make this delicious cake. It wasn't too sweet, yet it was extremely moist with a crisp crust. Thank you!! I look forward to trying out many more of your recipes! Apples work year-round. Look at you baking away! (Can you tell I'm finally coming out of hibernation and catching up on food blogs?) I'm saving this one. You know how much I love easy cakes.